In this article I am going to cover a Sorcerer Tank Build. That’s right, you heard me. This is a build that is going to make your Sorcerer impossible to kill, but the trade off is that, unlike for example with a Dragonknight Tank, there are no team buffing abilities. You will, however, contribute by doing more damage then a DK Tank. 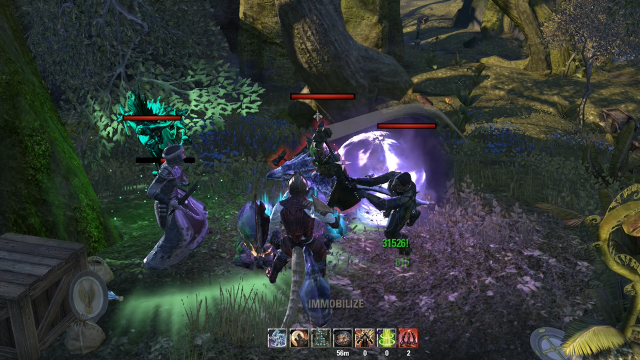 There are lots of ways how to build any Tank in ESO, but it is dependent somewhat upon Sets and other factors. Additionally, some Builds may work better in specific PvE content and some might be better in PvP then in PvE. This build is good for most PvE content, and is updated for the Murkmire DLC. 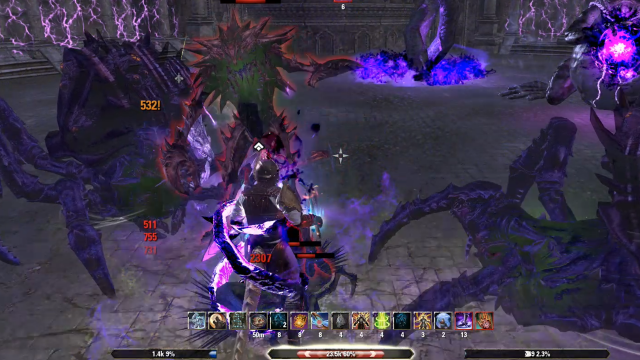 The Everlasting Lightning Sorcerer Build revolves around massive self heals and self buffs. It is a selfish build, but one that can be changed depending on your gear and ability setup. As long as you can stay focused on keeping enemies taunted, lack of support abilities should not be too much of an issue. With such high Resistance to any damage type, and insane self heals, there is almost nothing that can kill you. Attributes for this build can be adjusted to your liking because every combination works. We need all 3 resources, but we can restore all 3 through abilities and potions, and in this build you can use 2 abilities that restore resources. Dark Deal restores Stamina and Health, and Spell Symmetry trades Health for Magicka. It is up to you if you want to use them at all, but they are listed here so that you know there are other options but potions. For these reasons I have gone with balanced attribute spread. Both bars consist of abilities that either buff or heal. There are some important interactions between the front and back bar, that you should know. 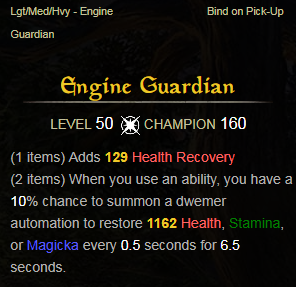 On the front bar we have Bound Aegis that, while slotted, gives us permanent Minor Ward and Minor Resolve buffs. On the back bar the very first ability that we use when going into combat is Boundless Storm that grants Major Ward and Major Resolve. Minor and Major buffs stack, and that leads to a massive boost to Physical and Spell Resistance. Restraining Prison (back bar ability), gives Major Vitality and due to Naga Shaman set whenever Hardened Ward (front bar) is used, we get Minor Mending and Minor Vitality. Those two combined lead to massive heals! Pierce Armor – A crucial Tanking ability that taunts enemy in melee range and debuffs with Major Breach and Major Fracture, reducing their Spell and Physical Resistance. Heroic Slash – Slows movement speed by 40% and reduces the damage done by 15% of the afflicted enemy. It also grants Minor Heroism, granting 1 Ultimate every 1.5 seconds for 9 seconds. This ability is optional, and can be exchanged for something else. Hardened Ward – The only Sorcerer ability that can spawn a Damage Shield, and with it trigger the Naga Shaman Set bonus. Very useful to pet as well, since it puts a Shield on them too. Bound Aegis – Increases damage reduction when blocking by 36%. 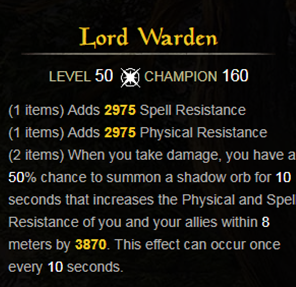 More importantly, while slotted, it grants Minor Ward, Minor Resolve and an 8% Max Magicka increase as long as front bar is active. A fantastic passive bonuses without even using the ability. Unstable Clannfear – A crucial ability. 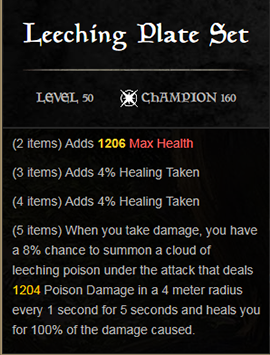 Pets have been buffed recently, and the Clannfear heal with this build can go up to 30k. Due to the Expert Summoner passive Max Health is increased by 8% when pet is active as well. Restraining Prison – An optional ability that immobilizes enemies and grants Major Vitality but for only few seconds. It can reach a max of 6s, but if you don’t think it’s worth it you can slot something else instead. Boundless Storm – A crucial ability that transforms you into pure lightning, dealing shock damage every second to anyone nearby, but more importantly granting Major Ward and Major Resolve while it is active. Inner Beast – A Ranged taunt that is converted to a Stamina ability with this morph. We can always use Dark Deal to regain stamina back so it is best to save Magicka for other things. Dark Deal – A great sustain ability that uses Magicka to restore Health and Stamina. Used only when at low Stamina. Unstable Clannfear – Have it slotted in this bar to get 8% increased health as well while back bar is active. Absorption Field – Creates AoE heal and removes any enemy AoE abilities. It also stuns everyone inside it. Great for helping out allies and yourself. Aggressive Horn – Commonly used Tank ultimate that increases Max Magicka and Max Stamina by 10% for 30 seconds. It also grants Major Force, increasing critical damage by 15%. First, have the Clannfear summoned at all times, and then Boundless Storm needs to be constantly active during combat. After we get in the midst of many enemies, that is when Restraining Prison should be used to immobilize and to get the Major Vitality buff. Then we switch bars and immediately we get the passive buffs Minor Ward, Minor Fracture and increased Max Magicka by using Bound Aegis. Use Hardened Ward to get a Damage Shield for yourself, and pet, while also receiving Minor Vitality and Minor Mending from Naga Shaman. Pierce Armor and Inner Beast are taunting abilities that are used depending on the battle situation. When low on Stamina use Dark Deal, and when at low Health use the Clannfear heal. If you do not want to play either of these races, Imperial and Nord are also good choices for a tank. Imperials have increased Health and Stamina, with a chance to restore Health with melee attacks. Nords come with increased damage reduction, cold resistance, Health Recovery and Stamina (all great passives for a tank). These are typical tanking champion skills that increase Healing Received, reduce damage from all sources, as well as blocking and rolling stamina costs. Only 2 skills are not for tanks which are Master-at-Arms and Elemental Expert. Both serve one purpose, and that is to increase damage from Boundless Storm. We are going to be in that form all the time so no reason not to help the team by dishing out some damage. This build is centered around Naga Shaman set which is perfect for a Sorcerer tank that uses healing to keep itself alive. The second set and Monster Helm Set depend on what kind of tank you want to be, more on a selfish side or providing team with buffs. There are almost no wrong choices here since ESO offers wide variety of amazing tanking sets that can be combined with one another. Below is the setup I use. I went for a selfish build and chose Leeching Plate as my second set, and is probably the best set to have if you are building your tank around powerful self heals. The tooltip says that it heals only for 100% damage done when it procs, but these numbers will be increased from all your healing buffs. The most important thing to know is that they are way higher then what the tooltip says. One tick can go up to 7k or maybe even more, and that is only 1 tick. There is 5 of them since it lasts for 5 secs. It does not matter what Weapon you have in your primary and secondary slot (as long as you have a Shield in the off-hand). 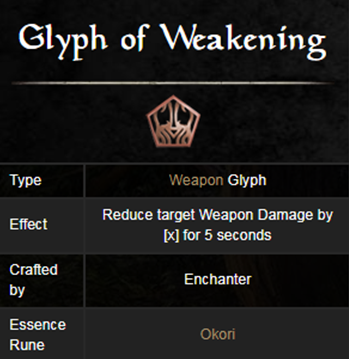 One should have Glyph of Crushing and the other one Glyph of Weakening. 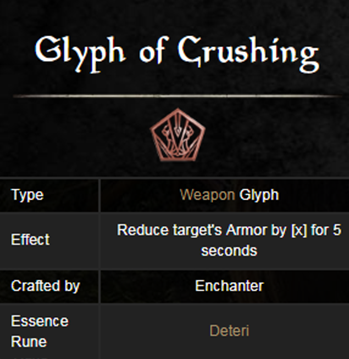 Crushing reduces enemy Physical and Spell Resistance for 5 secs and has 10 sec cooldown, while Weakening reduces damage done by the enemy for 5 secs with 10 secs cooldown. Both debuffs stack with Major Breach/Fracture and Maim from skills such as Pierce Armor and Heroic Slash. The Infused Trait on Weapons is always fantastic choice. On Armor Pieces tanks always want the Sturdy for Trait, because reducing the cost of blocking is very important. Running out of Stamina means a quick death. We have Dark Deal to help us with Stamina management, but sometimes you won’t have enough Magicka to use it, so having the ability to block a couple of more attacks can make a difference between life or death. For Enchantments we want is Glyph of Prismatic Defense or Healthy. Tri-Stat is better for this build, but be sure to only use them on your Chest, Legs, Head and Shield to get the most out of them. Use Health for the other pieces. The Jewelry Trait we want is Triune, Health or Stamina. Triune would be ideal, but it is also hard to get. 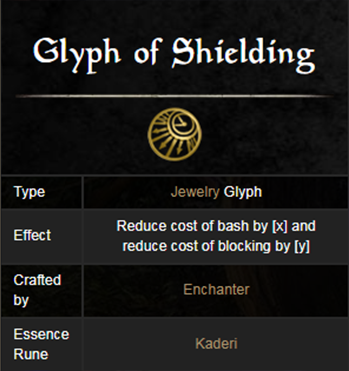 Glyph of Shielding is the Enchantment we want on our Jewelry to reduce the cost of blocking even further. This Enchantment is the single best way to reduce your block cost! Having high Max Health is recommended because the Clannfear healing ability heals for 35% of max health, though that is increased further through healing bonuses. That is why The Lord is best Mundus Stone choice here since it increases Max Health. Also, be sure to eat Food that gives a good amount of Health. There are some great ones that give all 3 stats as well, so be on the look out for those. There are lots of things that can be changed to make this build more team friendly. 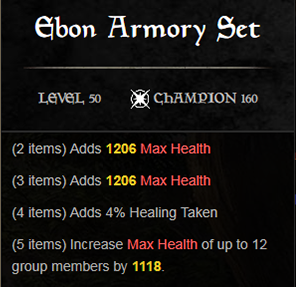 Some sets like Ebon Armory and Lord Warden are commonly used because they are great for supporting others. 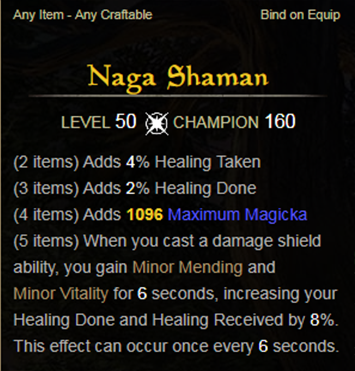 Add those two to Naga Shaman and you wont lose too much survivability while also being highly valuable to the team. Aggressive Warhorn is a great support Ultimate, so utilize it more often than Absorption Field. Bone Surge is also very good support ability that can be used instead of another ability above. It all depends on the content you are trying to do, and what you are comfortable with. If you decide not to use Spell Symmetry, like I did in this case, then running out of Magicka is a reality. To counter that just have any kind of potion that restores Magicka at the ready, with Tri Stat Potions being the optimal choice. 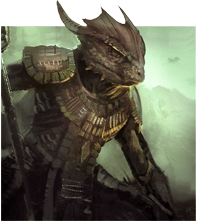 However, being an Argonian means you will get even more out of just regular trash Magicka Potions. Sorcerers are selfish tanks for the most part but it pays off since with setup like this they almost cannot die. 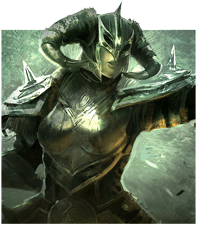 Be sure to check out our other ESO Guides!